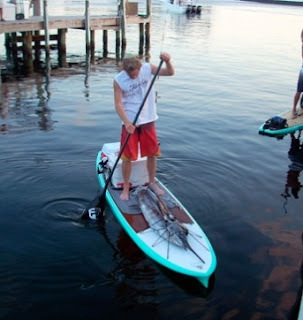 Lance Moss got everyone’s attention when he paddled to the dock with a 65.8 pound sailfish strapped to his paddle board. The sailfish measured 68 inches long. The sailfish was caught on a Mitchell spinning rod and reel with 30 pound test line using a live LY. Moss was participating in a fishing derby called the Destin Fishing Rodeo when he caught the sailfish. The Destin Fishing Rodeo (Destin Florida) is a month long fishing derby that was established in 1948. The Rodeo rules cover 33 species of fish in 29 divisions. Moss’s sailfish is the first ever caught in the paddle board division.